Housed in a former AAMCO Transmission Plant still in the heart of Bend, just off of Division Street, The Crux Fermentation Project can be a little tricky to find. They are at the east end of Industrial Way where it hits Division Street. Drive right on by the “Private Road signs and the railroad tracks. 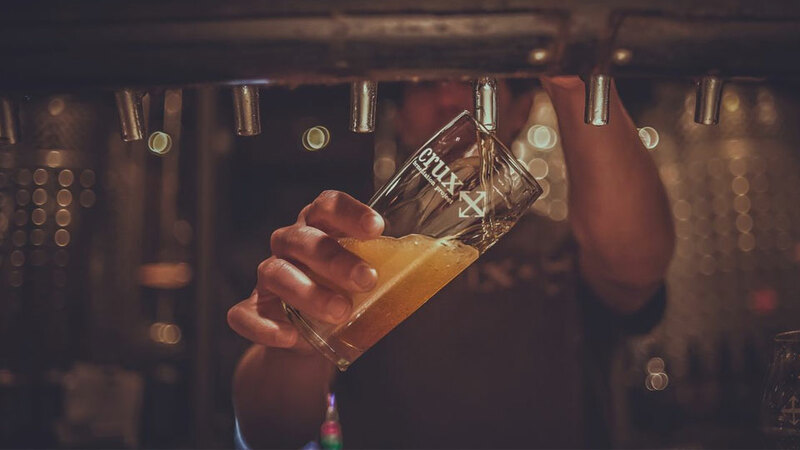 The Crux was inspired by their unique location to use non-traditional methods such as decoction mashing, open fermentation, and barrel aging to brew their beer, which is currently distributed throughout Oregon and Washington, and parts of Idaho, California, Colorado, Washington D.C., New York City, Vermont, Maine, British Columbia and Alberta, Canada. With 20+ original craft beers on tap, their tasting room is right in the middle of the brewery. Tasting hours vary by the season, but they do offer free tours 3 days each week for up to 8 people with reservations. Minors are welcome in the restaurant, just not at the bar. Dogs are welcome too, leashed and outside on the spacious grounds by the food carts. Check their Events page for live music.